I entered the world of self employment in January 2016. I was hopeful. And optimistic. I thought that being supremely good at what I do and having an awesome service, with (obvious) benefits for my target market, was enough to carve out a successful career. It’s not. Ok, people? IT’S. JUST. NOT! I don’t want to come across as negative. Nope. But it’s important that I’m honest, right? How else will you benefit from this insightful blog?! I’ve been treading the waters of entrepreneurship for only four months but my, oh my, I’ve learned HEAPS! 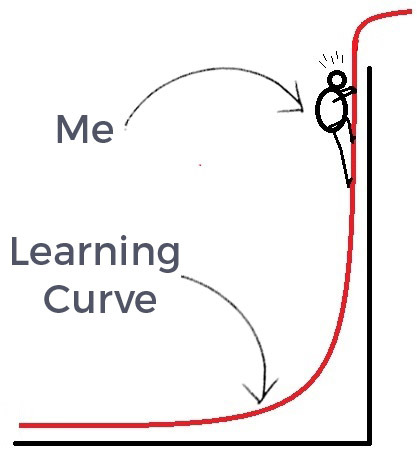 Here’s a snappy illustration of my learning curve. There has to be loads of people out there, in a similar situation to me, that would find it useful to read (or sympathise) about the five most important things I’ve learned about setting up my own business. I’m still learning, so this is a snapshot of what I’ve learned so far. It’s really important to validate your assumptions, where your business is concerned. This means you need to ask your target market if indeed your perceived problem exists and whether your service solves it. Sounds pretty obvious but Market Research was something I’d never actually undertaken previously. One of the best ways to do this is via an online survey – this means you can ask a whole heap of other stuff. I followed up survey responses with a quick phone call (in most instances the phone call was requested) to provide more background on my service and to get more insights from my prospective clients. They’re the experts after all. The information and insights you gather from Market Research will help inform your business objectives and marketing strategy. Therefore, it’s SOOOO important that you spend the necessary time on this. Your website isn’t an add-on to your business. It’s central to your branding and marketing. If done correctly, it tells the story of who you are and what your purpose is. It helps to connect you to your ideal client and assists in setting you apart from the competition. Make sure the website design and content is snappy – the design needs to be impactful and the content, concise. Have a look at the websites of your competitors; what works and what doesn’t? Learn from this. Undertake research on the most popular/trending/effective websites and use these to help form your opinion on what type of website design appeals to you and your market. You don’t need to spend $$$ on a decent website design, admittedly, it’ll take longer if you do it yourself. But if you’re a start-up business, keeping initial costs down is a priority. So consider using website templates as a starting point (WordPress has a wide range available, both free and paid). And finally, get feedback, once you have an initial first draft of the website up and running. Peek User Testing is a fantastic resource, that provides real-time, recorded feedback on your website design. The tests focus on the user experience, navigation and content. Even if you’re not a start-up business, you can use this facility, to make sure that your website is still on point. You get 3 FREE user tests per month. What are you waiting for?! In every sector, there are key influencers; they could be industry experts, or founders of leading organisations associated with your industry/client base. Either way, it’s important to know these people and to connect with them. The reason for this is simple: there are always potential collaborations and partnerships ready and waiting to be explored and if you partner up with a key influencer, the rewards for your business, could be IMMENSE. Don’t be afraid to drop a key influencer an email, or suggest a meeting. If you have done your homework (market research/customer feedback), and can state confidently, what you and your business, can bring to the table, AND can present a mutually beneficial proposal, people WILL listen. Marketing isn’t just about uploading the odd Facebook post, or random Tweet. Effective marketing is targeted, informative and tells the story of what you do and HOW it benefits your clients. Clever marketing makes use of market research and customer feedback to validate and quantify your service. USE it to great effect in your marketing, to help educate and influence your target market. One of the most important things I’ve learned about effective marketing, is that it’s consistent. Ideally, you want to get to the stage where, due to your effective marketing strategies, your ideal client, will immediately think of you, if/when they have encountered a problem that your service solves. Take the necessary time to research effective marketing strategies; refer to online resources or buy a few recommended books. Regardless of the source, this reading material is essential to making sure you implement strategies that are effective and deliver results. Below is an example of when I seriously upped the ante, where my marketing is concerned. I used stats to confirm one of the the pain points for my target market, then I specifically addressed that pain point, by providing stats from my customer feedback, that confirmed my service provided a solution to that pain point. I learned this very valuable lesson at the start of my entrepreneurial journey, when I tried to offer my services to a wide spectrum of Creatives. And I’ve read this little nugget of wisdom many times. There’s a certain mindset, when setting up in business, that if you try to cater to everyone, that you’ll be maximising potential sales/commissions. However, all you’re doing is spreading yourself too thinly and reducing your ability to be seen as an expert in your field or chosen specialism. Instead of offering a service that is ‘ok’ for a wide range of genres, it’s definitely better to provide a service to a select few, that excels at meeting client expectation. This way, you’re positioning yourself in a specific market, where you’ll grow in visibility, be respected for your contribution and valued for the expertise and experience you offer. I hope some of my tips have been useful! If you have any useful tips or advice for new businesses, feel free to drop ’em in the comments below.